Malignant melanoma is a rare and highly aggressive tumor of the nose and paranasal sinuses with a high incidence of local recurrence and distant metastasis. These tumors account for less than 1% of all melanomas and less than 4% of sinonasal tumors. Diagnosis is often delayed because of onset of symptoms are non-specific. Early diagnosis is important in management. Most melanomas of the nasal cavity or paranasal sinuses are treated with surgery to remove the tumor and a surrounding area of normal tissue. Lymph nodes in the neck may also be removed in an operation called a neck dissection. Radiation therapy is usually given after surgery. Advances in surgery, radiotherapy and chemotherapy have not had any impact on improved survival, which remains poor in this disease. For cancers that can’t be removed, radiation therapy, chemo, or other treatments (immunotherapy or targeted therapy) may be used. Although a melanoma that forms in the nasal cavity or a paranasal sinus is different in many ways from a melanoma skin cancer, it is often treated the same way when it is advanced. 66-year-old female began having nasal congestion symptoms. She is an avid gardner and felt this was likely allergies. After it didn’t resolve over the course of 2 months, she was an outside otolaryngologist who identified a mass that was biopsied in the office. The pathology returned as mucosal melanoma. Additional CT, MRI and PET scans were obtained to help determine the size and location of the tumor, which was predominantly in the sinonasal cavity. 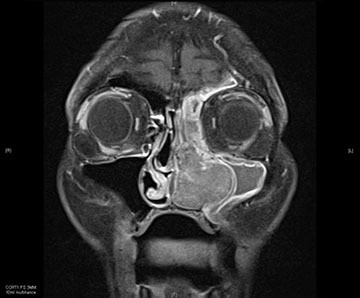 The tumor appeared to eminate from the head of the left inferior turbinate and extended throughout the maxillary and ethmoid sinuses all the way to the nasopharynx. She had a PET/CT scan to evaluate whether it had spread anywhere else in the body, which it had not. She was referred to a tertiary skull base center and a combined endoscopic and open procedure was performed to resect the entire tumor. Following this she underwent chemotherapy and radiation therapy as melanoma of the sinuses are very aggressive neoplasms. She is currently doing well and followed at regular visits and routine MRIs to ensure she had no recurrence of tumor. This is 64-year-old female who was identified with a large sinonasal mass. Pathology was confirmed to be mucosal melanoma. Pet/ct scan demonstrated no evidence of spread anywhere else in the body. She underwent a complete endoscopic resection. She is now 5 years out from surgery with routine surveillance MRI and Pet/CT scan demonstrating no evidence of recurrence.